Mango season is here again. Markets are flooded with small, big ,red, yellow and all kinds of mangoes. 😀 I know this is how kids react . But living a life like a kid-size ,adds meaning and life to it. Isn’t it? 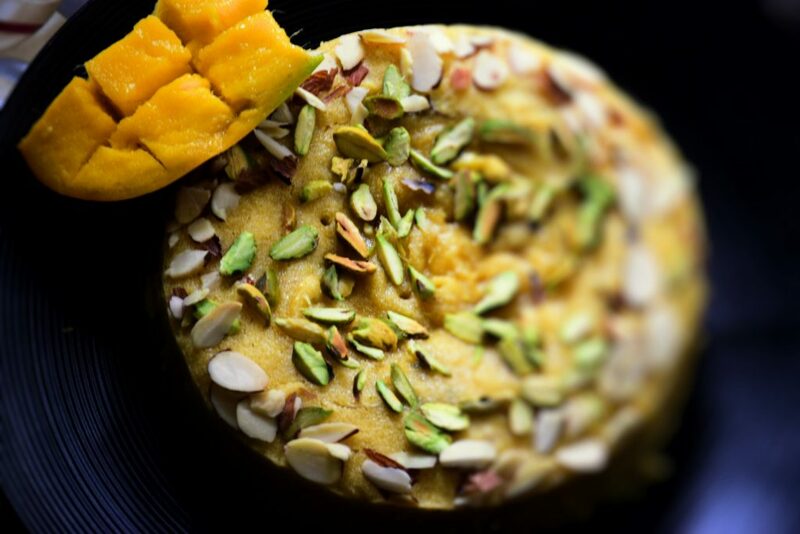 So if your family is a mango-fan, try this cake and you will never regret it. This cake is healthier than the APF-version, but not less glutenous than it. Honestly, I didn’t believe it to turn out as good as the regular mango cake , but it did turn out the way I wanted. This recipe has been adapted from the internet with a slight change. I washed two fresh tropical mangoes (mexican) and peeled them . 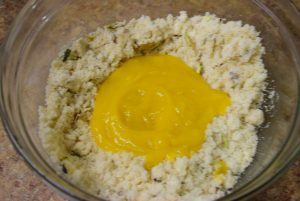 Cut and make them in a paste in a mixer. No doubts, that freshly made pulp has a fresh aroma, the fibrous strands of mango and gives a bright yellow color to your cake. In the meanwhile preheat your oven to 170 degree C or 325 degree F.
Sift the semolina through a porous sieve. 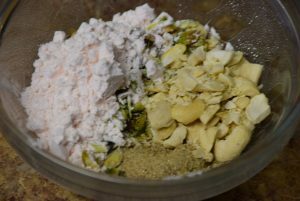 Mix the sliced nuts,cardamom powder in the custard powder or corn starch . Save some nuts for garnishing on the top . Also add baking powder to this nuts mixture. 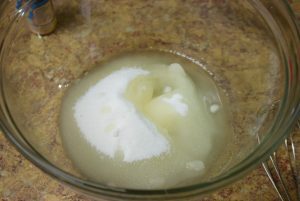 Add oil and sugar in a mixing bowl and mix it slightly with a spoon or a whisk. Add the semolina and mix it gently too. Also add the coated nuts ,mango essence and cardamom powder to the mixture. 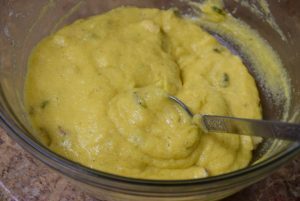 Once they are mixed, add the mango puree. This coating of nuts, help them to be mixed evenly in the batter, so that while baking they don’t sink to the bottom and gather there. Allow the cake batter to rest on its own for 15 mins. Prepare the baking pan by greasing it with oil /butter and lining with a parchment paper. 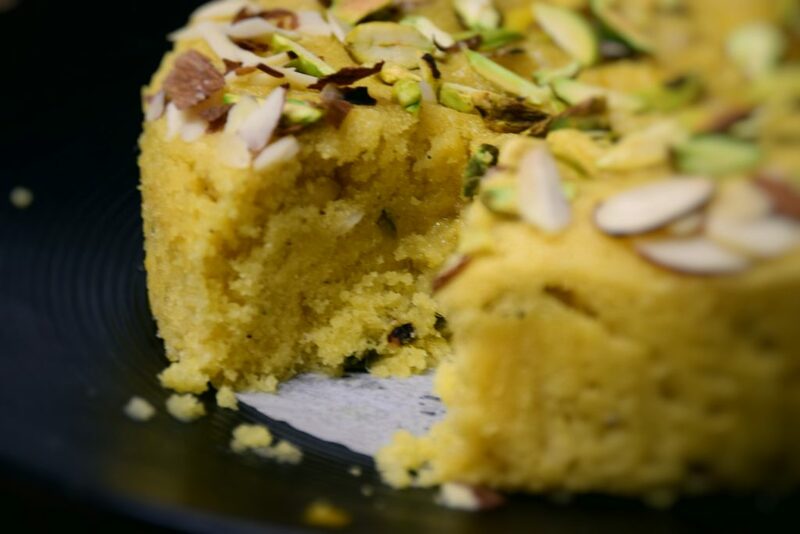 This rest time allows the semolina to soak up the extra moisture of mango pulp and saves time while baking. Also since today we are baking at a lower temperature , so that the color of our cake remains yellow and the outer layer remains soft and spongy like the inner layers. 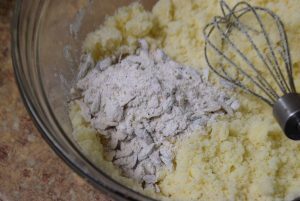 If you feel the batter is still runny, add a tsp of all-purpose flour or semolina to the batter and let it stand for 5 more mins. 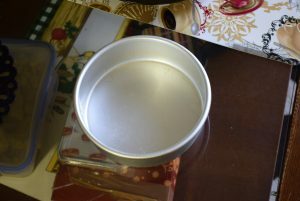 Now spoon the batter in the cake pan and tap the pan on the counter such that it sets and take its shape. Drizzle some saved nuts on the top in a design you wish and keep it in the preheated oven for 35 mins. Check the cake after 30 mins for done-ness by inserting a tooth-pick in the center. If it comes out clean, it’s done. 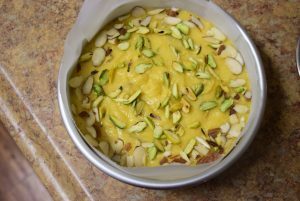 After exactly 35 mins , this cake was baked and it let out an appetizing mango aroma with it. Allow it to cool down slightly for 10 mins on the counter. Unmold the cake from the pan. 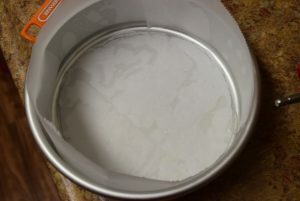 If the cake has baked properly, the pan will come out clean without any cake sticking to the bottom or sides. Cut a slice and enjoy with your evening tea. My cake was on a sweeter side, since I used 3/4 cups sugar instead of 1/2 cup. 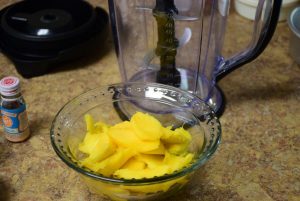 But if the mango pulp is on the sour side, use 3/4 cup and if mango is sweet ,then I think 1/2 cup will suffice. Indeed this cake is lighter than its Maida-version . 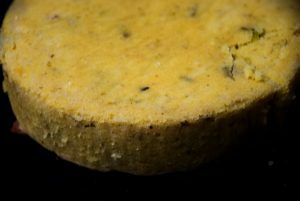 Also I avoid using baking soda or Eno, hence while making eggless ,butterless cake the proportion of oil – flour- puree has to be maintained. Mango season is here again. Markets are flooded with small, big ,red, yellow and all kinds of mangoes. 😀 I know this is how kids react . But living a life like a kid-size ,adds meaning and life to it. Isn't it? So if your family is a mango-fan, try this cake and you will never regret it. This cake is healthier than the APF-version, but not less glutenous than it. Honestly, I didn't believe it to turn out as good as the regular mango cake , but it did turn out the way I wanted. This recipe has been adapted from the internet with a slight change. 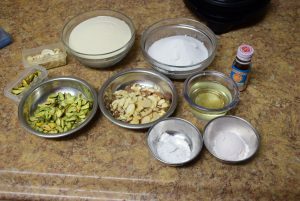 Also add the coated nuts ,mango essence and cardamom powder to the mixture. 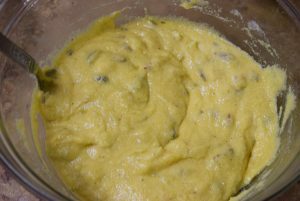 Once they are mixed, add the mango puree. This coating of nuts, help them to be mixed evenly in the batter, so that while baking they don't sink to the bottom and gather there. Check the cake after 30 mins for done-ness by inserting a tooth-pick in the center. If it comes out clean, it's done. My cake was on a sweeter side, since I used 3/4 cups sugar instead of 1/2 cup. 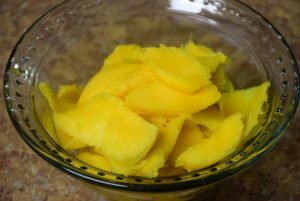 But if the mango pulp is on the sour side, use 3/4 cup and if mango is sweet ,then I think 1/2 cup will suffice. Indeed this cake is lighter than its Maida-version . 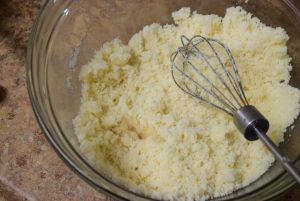 Also I avoid using baking soda or Eno, hence while making eggless ,butterless cake the proportion of oil - flour- puree has to be maintained. 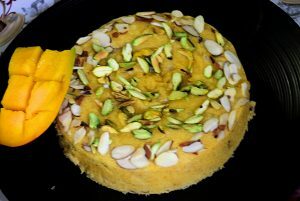 This entry was posted in Desserts, Food, Kids- Favourite, Recipes and tagged 30 mins recipe, almonds, badam, blender, butterless, cardamom, Carenshare, deep, delicious, dessert, eggless, fine semolina, fresh home-made pulp, fresh tropical red mexican mangoes, grinder, home-made easy cake, kaju, kids favorite, little baking powder, mango essence, mango paste, mango puree, mixer, no baking soda, organic canola oil, pista, pistachios, piste, shweta jindal, sieve, sooji, unsalted pistachios, yummy, zindagisikhati. Looks delicious, very well explanation of every step, will try for sure! !